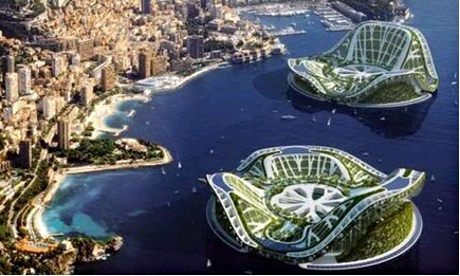 GeoGarage blog: Has the time come for floating cities? Has the time come for floating cities? Koen Olthuis (1971) "the Floating Dutchman" studied Architecture and Industrial Design at the Delft University of Technology. In 2007 he was chosen as nr. 122 on the Time Magazine list of most influential people in the world due to the worldwide interest in water developments. The French magazine Terra Eco chooses him as one of the 100 green persons that will change the world in 2011. In his vision today's designers are an essential part of the climate change generation and should start to enhance their perspective on urban components to become dynamic instead of static. His solution called City Apps, are floating urban components that add a certain function to the existing static grid of a city. Using existing urban water as building ground offers space for new density, offering worldwide opportunities for cities to respond flexibly to climate change and urbanization. The first city, in which this vision is being developed, is The Westland, near The Hague in Holland. This project incorporates both floating social housing, floating islands, and floating apartment buildings. In 2010, the government of the Maldives agreed to develop a floating city, floating islands, floating golf courses, floating hotels and a floating conference centre in a joint venture, as a solution to the problems caused by rising sea levels and also to encourage social and economic advancement. A sustainable future lies beyond the waterfront! From schools at sea to a city that perpetually sails the oceans, is climate change creating a bold new era of floating urban design? Until the late 1980s, nestled behind the Yan Ma Tei breakwater in Hong Kong's Causeway Bay, you could find tens of thousands of boat-dwellers who formed a bustling, floating district. The residents were members of the Tanka community, and their ancestors were fishermen who retreated from warfare on land to live permanently in their vessels. Until the mid-20th century, these traditional outcasts were forbidden even to step ashore. The typhoon shelter was famous for its restaurants' cuisine – including Under Bridge Spicy Crab – and it was a nightlife hub, alive with mahjong games and hired singers. Shops on sampan (flat boats) catered to the floating district's needs. It may seem like science fiction, but as rising sea levels threaten low-lying nations around the world, neighbourhoods like this may become more common. Whereas some coastal cities will double down on sea defences, others are beginning to explore a solution that welcomes approaching tides. What if our cities themselves were to take to the seas? A floating village at London's Royal Docks has the official nod, and Rotterdam has a Rijnhaven waterfront development experiment well under way. Eventually, whole neighbourhoods of water-threatened land could be given over to the seas. After decades of speculation and small-scale applications, the floating solution is finally enjoying political momentum – and serious investment. The immediate and most numerous victims of climate change are sure to be in the developing world. In Lagos, the sprawling slum of Makoko regularly suffers floods, and its stilted houses are shored up with each new inundation. It's under threat of razing by authorities. The Nigerian-born architect Kunlé Adeyemi proposes a series of A-frame floating houses to replace the existing slum. As proof of concept, his team constructed a floating school for the community. Still, many buildings do not make a city: infrastructure remains a problem here. One solution would be to use docking stations with centralised services, rather like hooking up a caravan to power, water and drainage lines at a campground. You could extend an existing city like London into the water quite far before ever being seriously challenged by infrastructure issues. But some ideas for floating life move well beyond the urban extension model. In the 1960s, futurist Buckminster Fuller designed a floating city, Triton, for 100,000 residents, and even had his plans approved by the US Navy. UK designer Phil Pauley has updated Fuller's geodesic concept: a ring of spherical modules, his SubBiosphere2 would float in fair weather, then submerge whenever the seas became rough. Florida architect Jacque Fresco, meanwhile, foresees a time when humans must colonise the sea, to escape land made uninhabitable by overpopulation. He has spent his career designing cities of the future, and himself lives in a dome-shaped prototype. Fresco's floating city designs – generally gear-shaped – prescribe the use of "memory metals". Compressed into small cubes, they are easily towed out to sea, where they can be snapped back to the size of buildings. Mobility among the waves lends floating communities a degree of political independence. The Seasteading Institute, founded by Patri Friedman (grandson of Milton), proposes a series of floating villages, and claims to be in active negotiations with potential host nations that would give the villages political autonomy. Billed as a startup incubator for political systems, the aquatic communities would serve as experiments in governance – and represent a rejection of what Seasteaders see as big government intrusion. The Seasteading Institute proposes a series of floating villages – and claims to be in active negotiations with potential host nations. In an implementation plan for these Seasteading cities [pdf], the Dutch engineering firm DeltaSync has proposed a modular building strategy. It too would have movable parts, for gradual growth and financing, and a dynamic geography: if new friends decide to be neighbours, they could simply tow their houses together. At first the villages would aggregate in protected waters. Later, they would cut ties with land altogether. That's when all the trappings of civic life would be either abandoned or reproduced in microcosm on the rafted village. Many of the technical components of DeltaSync's plan are well-trodden territory for engineers. Platforms and mooring systems are not so different from those required for large boats or oil rigs. Along with reclaimed land, floating additions to city infrastructure are becoming a regular part of municipal planning. Airports are particularly prime for floating: they essentially require a large platform that is close to the destination city without being intrusive. As for infrastructure solutions, they range from the well-tested to the speculative. The abundant wind available at sea could power turbines. Ocean thermal energy conversion could harness the temperature difference between the surface and the depths – a process that also provides fresh water as a byproduct. DeltaSync even envisions residents cultivating aquaculture in lieu of gardens, manufacturing their food requirements from nutrients found in upwellings at the edge of continental shelves. A so-called "Blue Revolution" in aquaculture would be required for the oceans to provide this level of sustenance. For untethered floating societies, it's not just physical infrastructure that needs to be planned out – it's the social infrastructure, too. Floating citizens still need jobs to do; they need to do their shopping and educate their children. When the worst happens, they need access to medical care. A full-service floating city already exists for residents of The World, a 644-foot yacht that continuously circles the planet. Launched in 2002, the ship contains 165 condominium spaces that sell for millions. And it may soon be upstaged. Freedom Ship would essentially be a mile-long flat-bottomed barge with a high-rise building on top. Weighing 3 million tonnes and with a top speed of 10 knots, the floating city would circle the globe every three years, stopping 12 miles offshore at each port for a week at a time. High-speed ferries would connect the 40,000 residents and 20,000 crew to the mainland and bring back visitors. "We won't just be visiting those countries," says Freedom Ship director and executive vice president Roger Gooch. "We anticipate those countries visiting us." Freedom Ship's size – and its $11bn price tag – gives it a credibility problem. But Gooch has "two or three irons in the fire in Asia" to secure his team's capital for the three-year construction process. It will be too big for any existing shipyard to build, so the ship must be constructed in pieces and – a familiar idea by now – towed out to be assembled at sea. Credibility problem? … the perpetually sailing Freedom Ship would have enough room for 50,000 permanent residents. The thriving Hong Kong sampan-dwelling community of Causeway Bay was not to last. There was no garbage or sewerage treatment system, and fire constantly threatened the wooden structures. Breakwaters that made up the typhoon shelter also limited water circulation, leaving pollution to accumulate in the harbour. The wastewater from the moored vessels combined with leaked sewer discharge and storm drain runoff to create unsanitary living conditions. When Tanka families were offered public housing on land in the 1980s, most chose this option. Now only a few traditional sampans are left, used as ferries to take tourists to their luxury yachts. Despite sewerage improvement schemes, E Coli levels remain high, and tests show alarmingly high levels of tributyltin, a toxic biocide, in the water. If floating communities are the way of the future, we will have to learn this lesson well: we can no longer simply outrun our own refuse. Untethering from land seems a big moment for a floating city, akin to blasting off to colonise another planet. To reject our ancestral habitat to this degree seems like hubris. How could a group of people survive alone among the waves? But it is a fallacy to imagine we're self-sustaining even in our land-based communities. Many of our essential goods arrive by tanker anyway – a sea-based location would be all the more convenient. Far from impractical utopias, floating cities could be every bit as integrated into global society as the ones we already have on land.